You may not be aware of this little fact, but we’re born with quite a few sweat glands–2 to 4 million sweat glands to be exact. Now depending on how many sweat glands you’re born with will determine how much you sweat. Women tend to have more sweat glands then men; but men tend to be more active then women resulting in more sweat produced. Some think of sweat as a huge inconvenience; sweating during exercise is one thing, but sweating when you’re anxious, embarrassed, angry, or scared is another thing all together. Some people despise sweat so much they are willing to to be injected under their arms with botox. Ouch! Okay, okay it’s true–sweat is not very popular, yet it is important and quite beneficial. So are you ready? 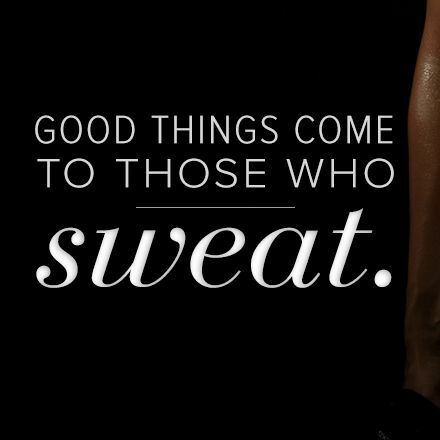 Then, Let’s get ready to…….Sweat!!! Sweating improves your skins flexibility and tone; making you look younger. Sweating enhance your digestive system, and helps to prevent constipation allowing you to release food that has been digested in the body within a 24 hour period. Sweating can release endorphins which gives you a feeling of wellness and happiness. Sweating helps you to release water weight. Although water weight is quickly replaced when you replenish your body with fluids; activities that helps you to sweat out that water, often burns up calories. I now realize that I really can’t control when I sweat or how much I sweat, so instead of working against that I’m going to just work with it because in the end sweat is only making me, a better me. So, release that sweat, and then soak in a nice relaxing bath surrounded by candles and the thought that you’ve just done something unselfish for your body!